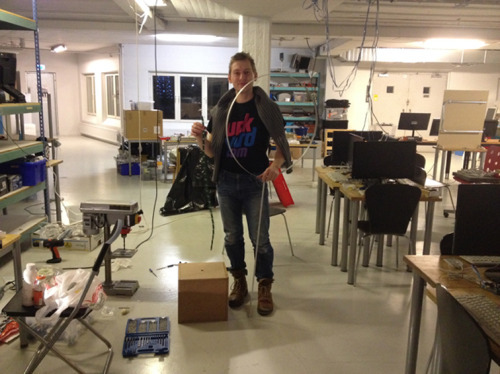 Patrik is a maker working on creating a large rotating spherical computer monitor. Full activity in the Hacker Club! Three weeks ago the Hacker Club started for 25 enthusiastic and engaged 9 to 12 year olds, who jumped right into the action of programming computer games and interactive experiences in Scratch on Raspberry Pis. Now into week three out of ten they learn awesome stuff in a fantastic pace! 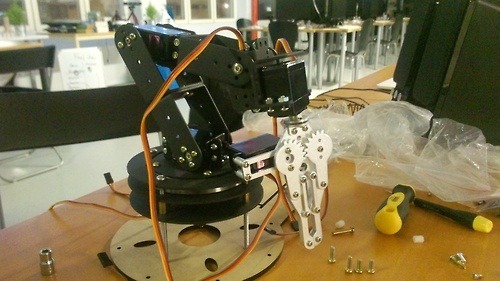 Saturday, March 1 at 4 pm – ca 6 pm at Collaboratory Polstjärnegatan 14, 2nd floor. 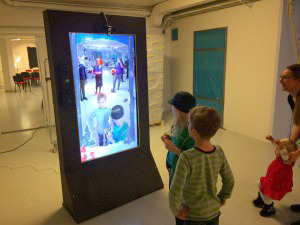 Carl Heath, Jacob Michelsen, Erik Einebrant and Linus Österberg Nilsson at Interactive Institute Swedish ICT built a magic mirror in 2013 for store interaction for a project together with H&Ms subsidiary Monki. The prototyperna were also used during Collaboratorys x-mas party. 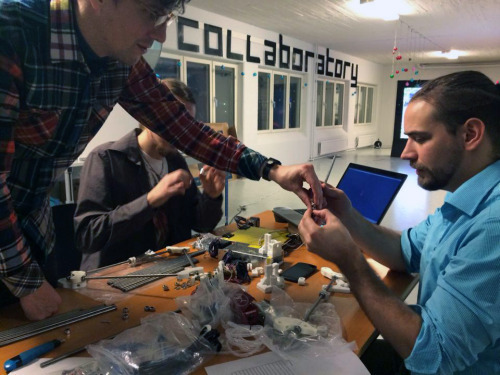 Collaboratory and Story architects partnered up with TEDx Göteborg, designed a lab for the participants and Jasmine talked about maker philosophy. We joined the global festival www.nordicfilmfestival.cc and screened Sacred Economics, The Cosmonaut, Free fall, Hello World! Processing and Recoding Innovation: Free Software – Free Culture. We also streamed The Cosmonaut live talk with the director and had discussions around transmedia, commons, free software etc, and played Mrs Dad by Redgrim on the Automat Indie Arcade silverbox. 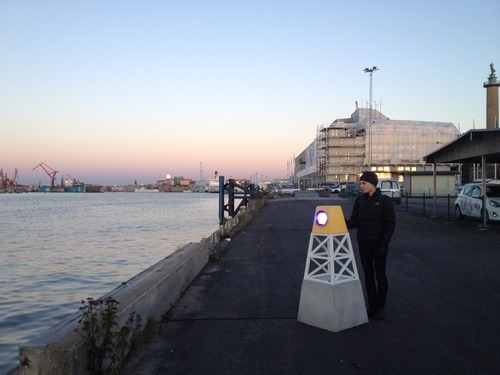 The festival in Gothenburg was curated by Jasmine Idun Lyman, in collaboration with Crowdculture, Gothenburg Film Studios, ABF Media lab and Automat Indie Arcade. Automat is an indie arcade based in Gothenburg building cabinets at Collaboratory. Automat loves games and wants to share that love with as many as possible. Third day of fixing the space. Jasmine, Henrik and Kjell building muscles. Today we carried 63 tables into the space and then ran the first Playcentric Writers Room lab in our new space. PWR is an experience design oriented writers lab in Gothenburg founded by Jasmine Idun Lyman at Story architect and Mats Björkin at Gothenburg University. Paul, CEO at Gothenburg film studios, says that we can try out doing something together with floor 2 in the building. July 9 2013 the first Collaboratory community, mainly consisting of people who have never met before, get access to the space and start cleaning and emptying it together with people from the studios. The first, uncertain steps are taken without any support from policy makers, city etc. Jasmine writes funding applications, sets meetings and spreads information about the initiative. The interest increases but everything is run by a few hard working individuals who spend the rest of the summer cleaning, painting and fixing in the space, with private money. June 5 2013 we have the 3rd open design meeting, around 30 people attend the meeting held in Gothenburg Film Studios conference room and we take a look at the space that the studios needs to share to keep costs down. Interactive Institute who looks for space and storage joins the meeting, we send a concept description to Björn Sandmark, Head of Culture in Gothenburg, who is about to meet the CEO of Älvstranden Utveckling AB, who owns the building. Unfortunately nothing happens this time either. We continue discussions about funding and a business model. A playcentric and experience design oriented writers lab in Gothenburg founded by Jasmine Idun Lyman at Story architect/Collaboratory and Mats Björkin at Gothenburg University. Another open design meeting, more curious people show up and we start a Facebook group for Collaboratory. Jasmine tries to get support by policy makers and other institutions, without any success. The community talks about funding and structures. A common vision is starting to take form. April 15 2013 Jasmine invited people to the 1st open design meeting. A improvised meeting to talk about creating a new platform for storytellers to meet and exchange knowledge, have a working space and meet people of all ages. A politically independent free zone for labs, bridging initiatives and synapses. A first step for open dialogue and design determined by the attendees. 4 persons met at the small Story architects office in the Gothenburg film and games village at Lindholmen.